Unlike many industries, office views in the agriculture industry can vary quite a bit. Your office may be in the cab of a tractor, out in the open prairie checking on your cattle herd, or in a manufacturing facility. There are many, however, who still work in a traditional office setting, and if so, there are several things you can do to spice up your office and give it a fun and agricultural flair but still have a functional vibe. If you are like me, your workspace plays a huge role in your productivity so personalizing the space, as well as having an organized one, is an important factor. Here are some fun tips to elevate your “ag style” and stay organized. If you are like me, it doesn’t take long, and random papers start accumulating on my desk and before you know it you have stacks upon stacks! We all know this is not functional, especially when I start looking for that very specific piece of paper and it is nowhere to be found. Having a filing system is important to keeping your documents in order. Some even suggest using a color-coded filing system and separating it into color-coded categories. There’s nothing like having personal family photos at your desk of your farm or ranch operation or even your livestock. It’s nice to have a little something that reminds you of home and make spending 8 hours in an office a little more enjoyable! A computer and phone system are utilized in almost every office. With that comes cords, a million of them! They can sure become an eye sore and sometimes the first thing I noticed when walking up to someone’s desk. If you do not have a desk that will hide the cords, there are a couple things you can do to hide them. Try stapling the cords to the underside of your desk or down the legs to hide them and keep them out of the way. Another helpful tip for easy organization is to label each cord so you can assemble and disassemble your computer and phone easily. You know that bumper stickers that you accumulate at conventions like NCBA, IPPE or World Pork Expo? Stick those on your filing cabinet! I am known to have a million sticky-notes floating around on my desk. While they are very helpful when I need to write something down quickly, they often get lost in the shuffle. I started to utilize a dry erase board to write down thoughts and organize my ideas. Not only does this prevent clutter on my desk, but my ideas are easily seen and top of mind. 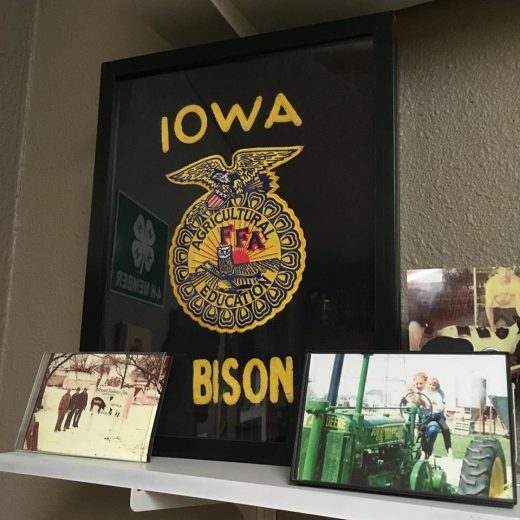 Hang up your old FFA jacket or your favorite agriculture painting on the wall. You can even utilize your favorite cowhide rug in front of your desk or at a nice seating area in your office. No matter your style, organization and personalization are key to having another successful day in the office. I know when my office has a little more life and order to it, I seem to get more done throughout the day. Hopefully these tips will help you too! Want your job search to be as organized as your office (or more than)? Check out these tips from Bonnie Johnson, AgCareers.com Marketing Associate.